If you own a home in Phoenix, you have the opportunity to create a beautiful manicured oasis around your home tailored to thrive in the desert climate. 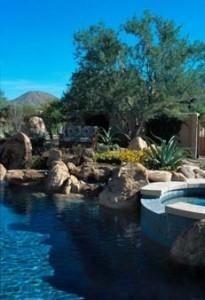 To choose the right landscape design Phoenix has to offer, hire the pros at Desert Environments. We customize your front or backyard by constructing outdoor kitchens, rockscapes, pools, water features, and much more. 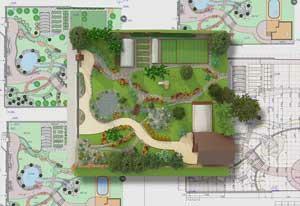 Desert Environments is more than a landscaping company. We build luxurious outdoor spaces for your home, from planting cacti and native flowers, to designing and constructing outdoor barbecue areas, swimming pools, rock gardens and more. We'll work directly with you to transform your yard into a paradise worthy of the gorgeous Sonora landscape you call home. The ability to be outdoors most of the year is one of the benefits of living in Phoenix and the surrounding area. While the rest of the country may be dealing with a wet or snowed yard for four to six months of the year, and everything outside needs to be brought in for safekeeping, Phoenix gets to enjoy year-round sun and landscaping design that lasts and lasts. Putting in touches such as an outdoor kitchen, water features, fire pits, and pools makes a yard into a true extension of the house. More than that, it makes it the favorite part of the house! Everyone has their own style. Whether you want a Greco-Roman style "bathing" area, a mission-style stonework setting, or an outdoor sitting room, complete with TV, library, and plenty of shade, Desert Environments has the landscape design in Phoenix, AZ that fits your flair. Creating an outdoor space that has your specific panache basically extends your home without all the construction. Maximizing the space you already have will bring you and your family outside to enjoy the open air and spend time together in everyone's new favorite room. Factor in the right lighting and you have your own peaceful, romantic evening getaway. Imagine a space to quiet down after a long day. Enjoy a meal. Watch the sky change in the amazing Phoenix, AZ sunset. Dip your feet in the pool. Enjoy a beverage. And take a deep breath! 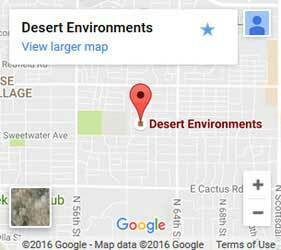 Call Desert Environments today for a free consultation with our contractor on your perfect Landscape Design in Phoenix, AZ.